As a woman in her early 30s, I am constantly wondering if we are ready to have children. Between layoffs, moving for jobs, and other things that have happened in the past five years, I’ve been nervous about us starting a family. With my biological clock ticking, I have been struggling to lose weight and have been nervous what will do if we can’t get pregnant. When I was asked to review Mom at Last, this seemed like a very personal book to me, especially as we are looking into having children ourselves. Are you considering adopting? 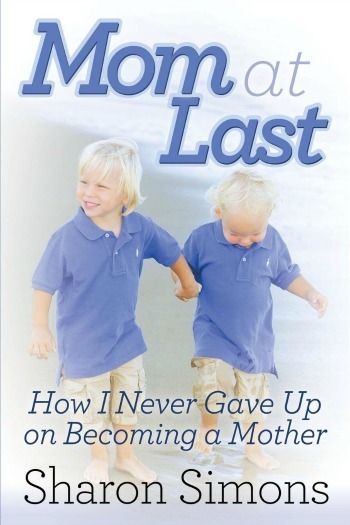 If so, we think you will love Mom at LastThis inspirational book is the story of how Sharon Simons, who after marrying late in life, had issues having children. After multiple failed IVFs and losing her unborn twins, she decided to adopt two Russian boys. This moving book will keep you wanting more and help other women understand that they not alone in their journey to become mothers. When I first picked up Mom at Last, I really not no clue what to expect. What I got was a raw, emotional book that I just couldn’t put down. This memoir was very touching and real, making me feel this poor mother more than once with everything she was going through. At the end of the book, even though you know the end, you can’t help but smile at the two proud parents bringing home their Russian boys. If you love reading memoirs and stories about adoption, I highly recommend picking up Mom at Last and give this book an A+ rating! Would you love to purchase this awesome book for yourself? You can purchase Mom at Last on Amazon.com for $14.69 or the Kindle version for $7.69. This sounds like a wonderful book, thank you for your review. I’m pleased to know that a book has been written about successful adoption and the happiness adopting a child or children really does bring to all. I would read this book with pleasure.